Pica is defined as the persistent ingestion of non-nutritive substances for more than 1 month at an age at which this behaviour is deemed inappropriate. It occurs most commonly in children, in patients with learning disabilities and in pregnancy. The aetiology of pica is poorly understood and is probably multifactorial. Clinical assessment can be difficult. History and examination should be tailored to address potential complications of the substance being ingested. Complications can be life threatening. Pica often self-remits in younger children. In those with learning disabilities, however, pica may persist into adulthood. Management strategies should involve a multidisciplinary approach, and interventions are primarily behavioural in nature. There is limited evidence to support pharmacological interventions in the management of children with pica. The eating of non-nutritive, non-food substances is persistent over a period of at least 1 month. The eating of such substances is inappropriate to the developmental level of the individual. Pica can be classified according to the particular substance ingested. Common subtypes are listed in table 1. Ingestion of non-food substances may also be associated with cultural practices. Geophagia, including the ingestion of kaolin (white clay), is seen in sections of the African-American population in the USA and is common practice in parts of Africa.3 Although often described as pica in the literature, these practices may actually be deemed to be socially normative practice and therefore do not fit the diagnostic criteria outlined in The Diagnostic and Statistical Manual of Mental Disorders, Fifth Edition (DSM-V). Pica is most commonly seen in children aged 2 or 3 years old. 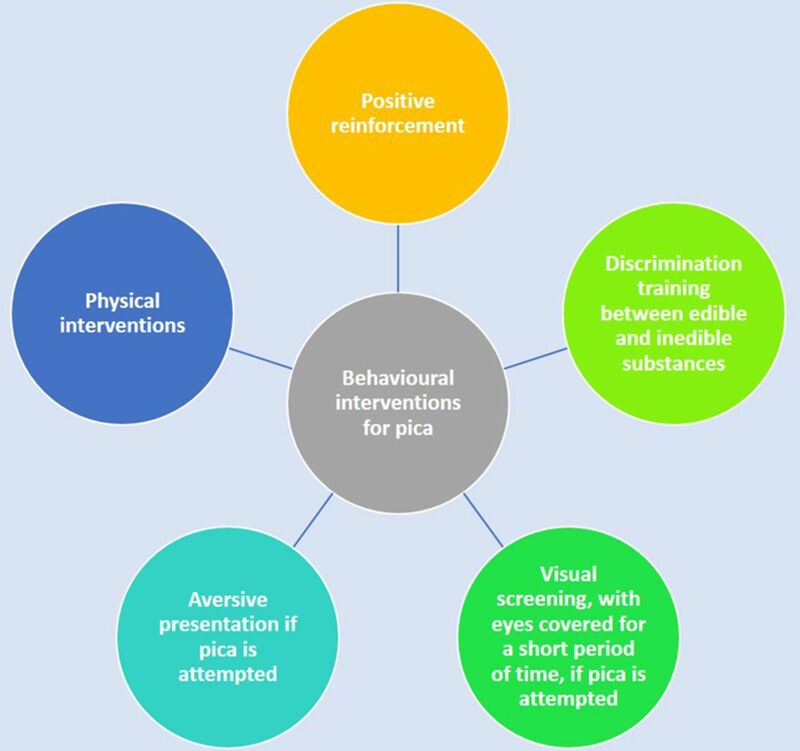 It may persist into adolescence when it is usually associated with learning difficulties.4 Studies suggest pica can be present in between 5% and 25% of children with learning difficulties. Pica is also common in pregnancy, occurring in up to 28% of cases. It typically occurs in younger women in their first pregnancy.5 This article provides an overview of the possible causes and potential complications of pica. In addition, it discusses important aspects of the clinical assessment, investigation and management of a child presenting with pica. The aetiology of pica is poorly understood and is probably multifactorial. Proposed mechanisms range from psychosocial to biochemical. An association between pica and micronutrient deficiencies, including iron, calcium and zinc has been well described. A recent meta-analysis confirmed the association between anaemia, low plasma zinc levels and pica.6 Children with pica may ingest substances rich in the nutrients in which they are deficient. However, there has been limited success in preventing pica in cases where nutritional deficiencies have been identified and treated. The clinical presentation of pica is highly variable and depends on the particular substance being ingested and the potential associated complications. History taking should focus on the substance ingested. If there is a risk of poisoning, the history should focus on the consequences of that poisoning. Enquire about symptoms of anaemia, such as pallor, shortness of breath, palpitations and lethargy. Ask about coexisting medical conditions that may predispose to pica. Take a thorough developmental and social history. Explore the patient’s living environment, for example, the risk of exposure to lead. Challenges may arise in consultations with older children, who might deny pica or show reluctance to disclose information. This may limit the clinician’s ability to make an accurate diagnosis and prediction regarding potential complications. 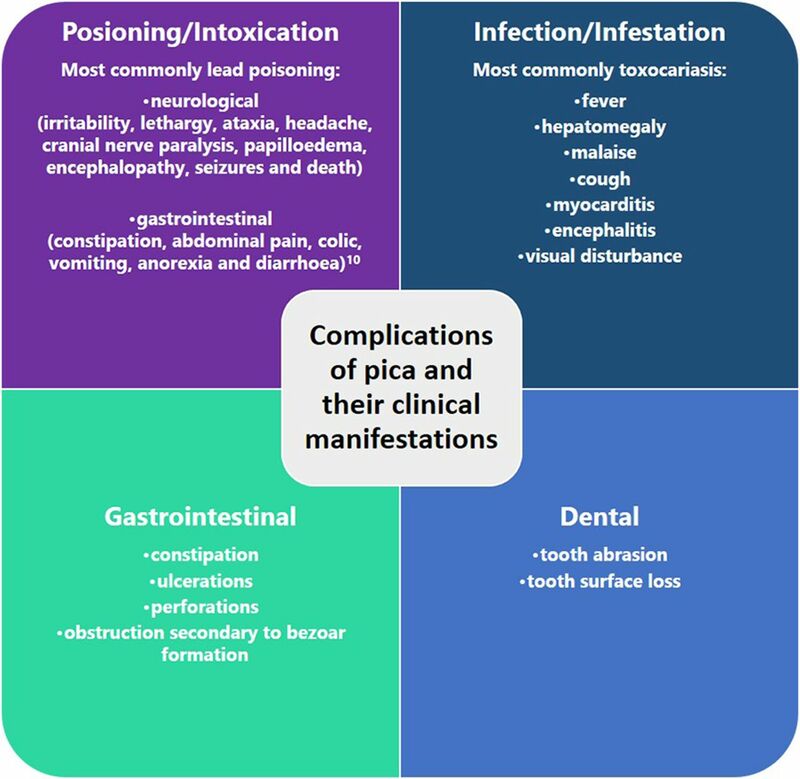 Potential complications of pica and their clinical manifestations. Lead poisoning is the most common poisoning associated with pica. Toxocariasis and ascariasis are the most common parasitic infections associated with pica. Manifestations may be a result of mechanical bowel problems, perforations and intestinal obstructions caused by bezoar formation around indigestible substances. Pica is a clinical diagnosis based on the DSM-V diagnostic criteria. Investigations may be useful in screening for potential causes and complications. The meta-analysis examining micronutrient status and pica noted a strong association between pica and anaemia.6 Check a full-blood picture and iron studies in all children. when environmental exposure is suspected. There is little evidence to suggest an ideal set of investigations in children presenting with faltering growth.14 Consider checking at least urea and electrolytes, liver function tests, calcium, phosphate magnesium and trace elements in these children. Although pica in young children and pregnancy normally remits spontaneously, it is a potentially deadly self-injurious behaviour. This is particularly true when it persists into adolescence and adulthood. Social stigmatisation may also occur. Pica is best managed using a multidisciplinary team approach.16 The team may include physicians, social workers, dieticians, psychologists and dentists. When devising a treatment plan, consider the symptoms and complications that the child is experiencing. Parents and patients should receive education around sound nutritional practices and be made aware of the potential severity of the condition. Treat any nutritional deficiencies identified. Time-out if pica is attempted. 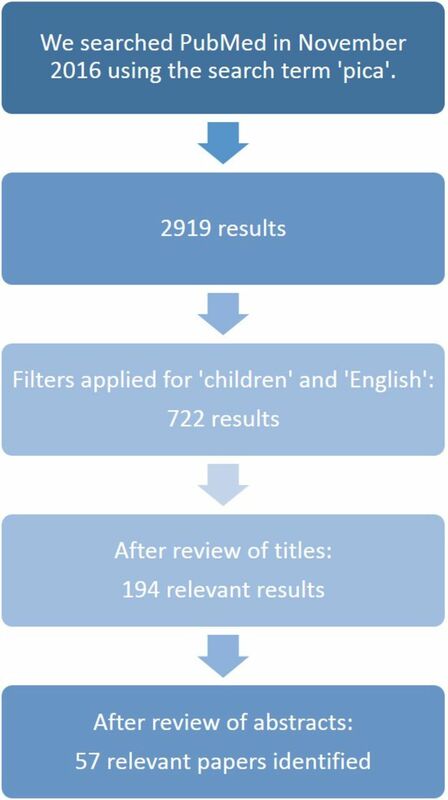 Flow chart depicting literature search. Pica is the persistent ingestion of non-nutritive substances for more than 1 month at an age at which this behaviour is deemed inappropriate. It occurs most commonly in children, in patients with learning disabilities and in pregnancy. The aetiology is poorly understood. History and examination should be tailored to address potential complications of the substance being ingested. Complications can be life threatening. Interventions should involve a multidisciplinary approach and are primarily behavioural in nature.
. Pica: common but commonly missed. J Am Board Fam Pract 2000;13:353–8.
. Developmental disability. JABFM 2001;14:80–1. American Academy of Pediatrics. Toxocariasis. In: Kimberlin DW , Brady MT , Jackson MA , Long SS , eds. Red book®: 2015 Report of the Committee of Infectious Diseases. Washington, DC: American Academy of Pediatrics, 2015:786–7.
. An unusual case of tooth loss, abrasion, and erosion associated with a culturally accepted habit. Gen Dent 2007 55:445–8. Learning Radiology. http://learningradiology.com/archives2011/COW_437-Bezoar/bezoarcorrect.htm (accessed Jan 2017).
. An update on Pica: prevalence, contributing causes, and treatment. Psychiatric Times 2008;25:66–73. Contributors BM wrote the first draft. TB and AT reviewed the content and suggested amendments that BM incorporated. All authors approved the final version.